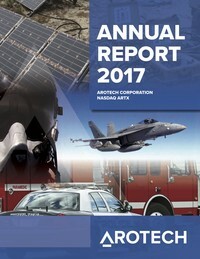 ANN ARBOR, Mich., Oct. 23, 2018 (GLOBE NEWSWIRE) -- MILO Range Training Systems, a unit of Arotech Corporation’s [NasdaqGM: ARTX] Training and Simulation Division, announced that it has received new awards totaling $2.5M from the U.S. Air Force (USAF). The orders include MILO Range Theater 300, MILO Range Theater 180, and MILO Range Advanced systems. The training systems will be used to train USAF security forces at locations within the USAF Global Strike Command (AFGSC), USAF security forces and law enforcement at Lackland Air Force Base, as well as a number of other individual security units around the globe. The training equipment is scheduled to be delivered in early 2019 and includes extended product support through 2024. These awards, combined with the PACAF order previously announced, total over $4M in recent USAF awards. The U.S. Air Force Global Strike Command is responsible for the nation's three intercontinental ballistic missile wings, the Air Force’s entire bomber force, to include B-52, B-1 and B-2 wings, the Long Range Strike Bomber program, Air Force Nuclear Command, Control and Communications (NC3) systems, and operational and maintenance support to organizations within the nuclear enterprise. The Command's mission is to provide strategic deterrence, global strike and combat support. The command has approximately 33,700 military and civilian personnel deployed to locations around the globe. Outside of AFGSC, additional MILO Range Systems were ordered for Training Squadrons at Lackland AFB and to support training USAF security personnel at Edwards AFB, Dover AFB, Hurlburt Field, and RAF Mildenhall & Croughton bases in the United Kingdom.